The arrest of Meng Wanzhou, the CFO of Huawei, on December 1st marks the second instance of a Chinese firm facing legal complications in the United States. The first was a seven-year ban on China’s biggest telecoms equipment manufacturer, ZTE Corporation, from doing business with US companies. The official American response justifies these legal actions on the grounds of violating the sanctions on Iran and North Korea. However, that justification may be a veneer for the America’s hidden motive: to ensure that China doesn’t become an all-powerful competitive threat. The United States is starting to feel the pressure from China’s rapid developments in the advanced technological sectors. The US can’t afford to lose its technological superiority. The tech sector is not only synonymous with high profits, it is also a powerful knowledge industry that stimulates economic growth and translates into a military advantage. China knows it and wants a piece of it. The recent set of escalations are signs of a simmering US-China tech-cold war and the immediate battle is about the rush to 5G wireless networks, a technology that will revolutionize how global data networks operate. Beijing is investing heavily in its technological industry. Consequently, Chinese companies are having a hard time distancing themselves from the perception of being under the thumb of their government – rightly or wrongly. Specifically, the Chinese government’s access to its companies raises serious security concerns for Western countries. David Vigneault, head of the Canadian Security Intelligence Service, recently warned the business community about Chinese state-sponsored espionage. It should come as no surprise that China is heavily financing this modern-day gold rush towards cutting-edge technology. Beijing declared that rapid tech developments across several sectors are now a national priority, and that it would provide all the necessary political and financial backing. These sectors include 5G networks, artificial intelligence, the internet of things, self-driving cars, battery technology, semiconductors, and smart cities. China has the necessary industrial and economic might but lacks the innovative capacity to become a technological superpower. This is evident in China’s difficulties with manufacturing top semiconductors and computer chips. As such, as part of Beijing’s big push, the Made in China 2025 program was announced back in May 2015, along with a global recruitment campaign, the Thousand Talents programme, aimed to attract the world’s brightest minds. China has also set a goal of enrolling half a million students by the year 2020, with an emphasis on attracting STEM students. It is expected that China will exceed that goal, as it seems like international students are increasingly attracted to Chinese universities. In addition to these initiatives, China’s strategy is to build its technological might by cultivating its own innovative capacity, restructuring its industrial policy, and acquiring foreign tech companies through mergers and acquisition. Beijing is trying to foster and transplant the world sharpest minds, plucking them out from technological hubs like Silicon Valley and Boston. China is also investing in infrastructure in emerging markets, from ports in Pakistan, to high-speed railways in Africa, to gas pipelines crossing Central Asia. Beijing’s Belt & Road Initiative, announced in 2015, represents over $900 billion worth of planned investments and adds to the $40 billion Silk Road Fund of 2014. The New Silk Road is an audacious plan to improve trading relationships with new markets which will not only keep China’s economy thriving, but will also allow transport and telecom companies to grow into global brands. Therefore, by helping develop these economies, China is also creating a future market for its tech products. “China’s growing influence is a concern for nations whose political interests do not always align with Beijing’s,” explains Paul Haenle, director of the Carnegie-Tsinghua Centre for Global Policy. As such, the Americans are aggressively using the US legal and financial system in hope of deterring China’s venture. In July 2018, Congress passed the Export Control Reform Act and is now considering applying new export controls on AI and other new tech. Adding to these regulatory pushes, the Committee on Foreign Investment in the United States has blocked various business deals, preventing Chinese companies from acquiring American ideas and technologies. The US does have an upper hand in terms of innovative capacity and the light regulatory touch allows for such innovation to be fully optimized. However, Trump’s powerful anti-immigration rhetoric and feud with Silicon Valley are already damaging America’s innovative might. American universities are attracting fewer foreign students. Foreign students are at the forefront of American scientific developments and become important drivers of the innovation economy. The number of international student enrolment dropped by 3 percent during the 2016-17 school year and the decline was expected to double in the 2017–2018 school year. Furthermore, Trump’s administration is considering banning student visas for Chinese nationals as a response to alleged intellectual property theft. Also, the US Supreme Court ruled in favour of Trump’s travel ban on six Muslim countries back in 2017, which adds to the impression that foreigners are not welcome in the States and further jeopardizes America’s ability to attract foreign students. In times to come, perhaps the greatest defining factor will be about the difference in level of state control over these emerging technologies. With its state-backed programs, China is set to have direct control over the technology developed by Chinese firms. The US government won’t have the same opportunity. The American firms simply won’t allow it and the legal system effectively shields them from having to do so. 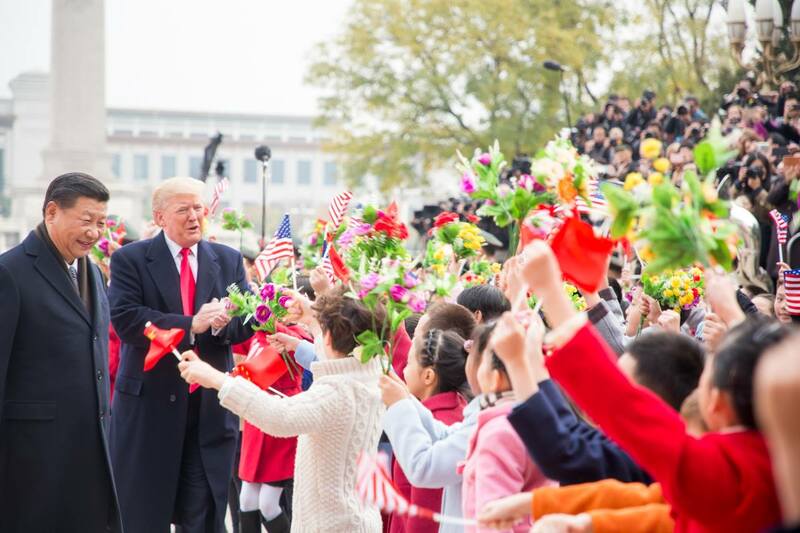 While the US and some of its Western allies are erecting walls, China is building bridges, offering connectivity and opportunities to the rest of the world. Only time will tell if the Chinese approach will yield more results than the American way. Though one thing is certain: Beijing is riding against the current wave of anti-globalization sentiment, which is sweeping through the western world. There is now a golden opportunity for China to act as the agent of global trade and to develop as a technological superpower. Featured image by the US Government, via Flickr Creative Commons.